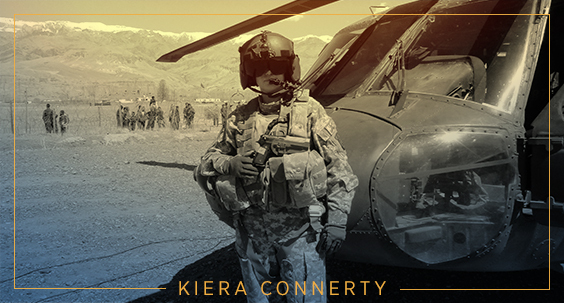 After graduating from West Point, Kiera Connerty (’15SPS, Sports Management) found herself piloting a Black Hawk helicopter in Iraq and flying missions near the Pakistani border in Afghanistan. She used the leadership and agility she learned in the military to get her Master of Science in Sports Management degree at Columbia University’s School of Professional Studies, which led her to a thriving career with the NBA. Below, she tells us about her journey and advises other veterans on their life after the military. After September 11, I was inspired to serve my country. I was raised in New York; there was even a period of time where my mother worked in the World Trade Center, and I felt a tremendous sense of duty to protect my city and my country. I was drawn to the focus and drive of West Point. After graduation, I went to flight school to learn to fly a Black Hawk. I felt a mixture of fear and excitement when we were deployed to Iraq: this is what we trained for. What was your experience during deployment? I was responsible for piloting a helicopter in Mosul, Iraq. In Black Hawks, you have a team of four, so you rely completely on your teammates. There’s no room to let each other down. During my second deployment, I was responsible for completing helicopter missions in Eastern Afghanistan, near the Pakistani border. We felt a sense of pride in completing our mission. How did you decide to transition out of the military? I was approaching the ten-year mark, where service members start thinking about the great benefits received upon retirement. But before I got there, I started to see my other opportunities. In the Army, I was working stateside with the Seattle Seahawks for community outreach. Behind the scenes, a major organization like that is different than what you see on TV. I wanted to be a part of it. I started interviewing with NBA before I first started at Columbia. But being in the program demonstrated that I was really committed to this new career. I started as an intern during the program. How did your internship lead to a job? Hard work. That’s what military veterans bring. The commitment to go above and beyond. There was an opening for a role I knew nothing about. It was offered to me because I was a hard worker. I’ve been with the NBA for four years now. As Talent Program Manager, my job is to focus on the careers of the employees at the League Office. We are constantly innovating to help our employees perform at the highest levels, and feel engaged being a part of the NBA. What did you take away from SPS? The caliber of the faculty is so high, and many of my peers were in the industry already. That gave me access to the career I wanted. The program also taught me how sports are transforming in this new digital age. And I learned how to navigate the landscape of sports institutions, which is a very different hierarchy and culture than the military. Working and studying full time was an enormous amount of work, but it was doable. I fell back on my Army training to prioritize and get it done. What advice to you have for other veterans? Don’t sell yourself short as you transition out of the military. Reach for the best possible education and career—but be open to all opportunities. The journey into your career is incredible, so take risks. In the military, we learn leadership, agility, and the ability to thrive in high-stress situations. Those qualities will serve you well in your career. Learn more about the Master of Science in Sports Management program at the School of Professional Studies and visit Student Financial Services for information about benefits and resources for veterans and service members at Columbia University.